I'm thinking about making Fridays all about food. What do you think? Cooking and baking are my other passions and I do alot of it so I thought maybe I might have a recipe or two you may not have seen or a technique you may not know....yet. These are the juiciest, easiest ribs you will ever cook. The best part, once the prep is done, so are you. We usually buy our ribs in bulk at Sam's Club as they're more affordable. They come 3 full racks to a package. What's great is that we can cook, freeze and simply pop them on the grill for a quick meal for ourselves, friends or if someone needs a meal. Here are the details: The recipe stays the same no matter the quantity. Preheat the oven to 275 degrees. Line baking trays with aluminum foil. Trim ribs of any extra fat and pull of the membrane on the back side of the racks. Cut the racks in two. If desired, you may put a dry rub on them (we always do!) I have a super recipe for one if you'd like it. After rubbing, place the ribs on the baking trays. Bake at 275 degrees for 3 hours. Ribs will be super tender and clean up is a breeze...just throw the foil away! Ribs may be eaten as is or thrown on the grill for a few minutes and slathered with your favorite BBQ sauce. That's it! Easy, peasy and oh, so good!! Oh my...I'm late to life today. We went to Ikea....AGAIN, yesterday. My DH is a saint. This is the 3rd time he's sacrificed his day for my studio. We thought it would be a quick trip up and back with maybe time for lunch but noooooo. It took 3 hours to get a straight. The Ikea return/exchange staff was super so it wasn't their fault. They brought down 3 separate units until we finally got all the pieces. We kept finding crooked boards. We have lots of respect for their patience, they reimbursed us for our gas/tolls (since it was the 3rd time) and were super polite/helpful. 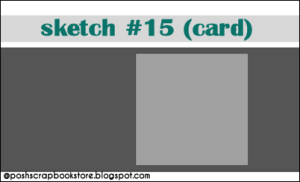 This is my LATE sketch submission for the Posh Designs Scrapbook store sketch challenge (PDSS15). You can flip, rotate, resize or do whatever your crafty heart desires as long as we can still see the original sketch in your creation then you're good to go! These challenges are on a bi-weekly basis, so that means you'll have two (2) weeks to get your creations completed, loaded and linked up! For this challenge Posh Designs Scrapbook Store is giving away... 3 Packages of Webster's Pages SPANKING NEW Fabric Ribbons from their brand new collections: Lullaby Lane, Garden Gala & Seaside Retreat!!! (5 fabric strips per cards - 18" each design). BTW...for those of you who are waiting for the info on the digital paper I used on this card, it's right here...Lizze Ann Designs Stars and Stripes. I just love it. I got mine last year and have used it often. Paper - SU So Saffron, Chocolate Chip, Gooseberry Patch DP (I will put some on my for sale page if anyone is interested).